Miley Cyrus and Liam Hemsworth are very much back in each other's lives and in the lives of many, many fans who were left brokenhearted when the pair split three years ago. After reuniting in December 2015, and after enduring the recent fire that destroyed their home in Malibu, the couple are stronger than ever! 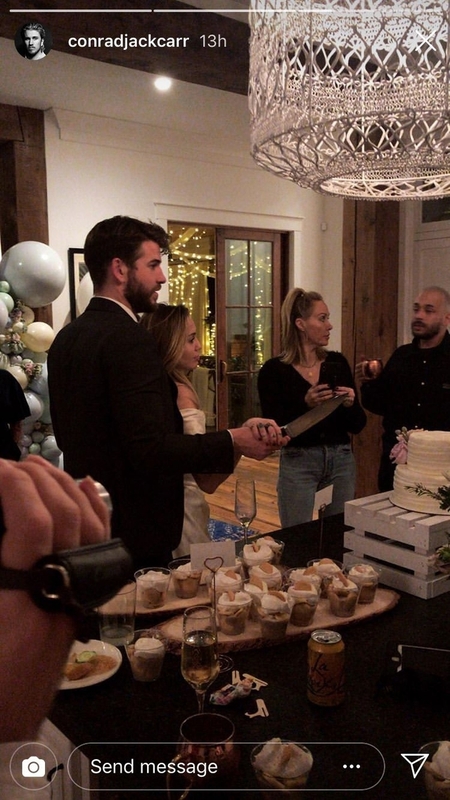 December, 2018: It seems like Miley and Liam are married! 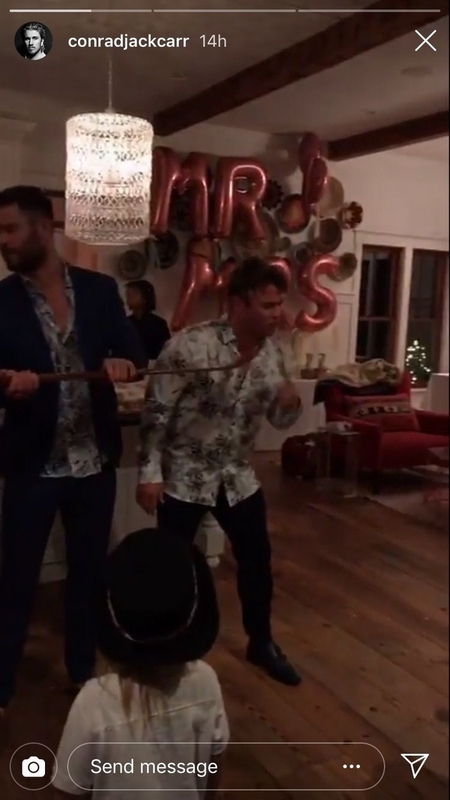 The couple spent Christmas Eve-Eve with friends and family, and based on the Instagram Stories we've seen, not only does Miley wear a white dress, there are also some "Mr. and Mrs." balloons in the background! June 2009: Miley and Liam first meet on the set of The Last Song, aka your favorite Nicholas Sparks movie after The Notebook. November 2009: Miley calls Liam her "best friend" in an interview with Seventeen. March 2010: Miley and Liam make their red carpet debut as a couple at at Elton John's AIDS Foundation Oscar event, confirming that yes, they are in fact dating. They also walk the carpet together for The Last Song premiere. June 2010: Miley reveals Liam was largely her muse for her album Can't Be Tamed. "There are a lot of songs that are about Liam," she tells MTV News. "All of them are about him in a way, but it's also about past relationships that you gotta get over and move on and just about freeing yourself from anything that you feel holds you back." August 2010: Miley and Liam's relationship endures its first break up, reportedly due to Miley's work schedule. September 2010: Miley and Liam are spotted running errands and eating together, suggesting they are back together again. November 2010: They break up again. A source tells E! it's "just a time out," whatever that means. April 2011: They're back on. But this time they're reportedly "taking it slow and just enjoying each other's company." December 2011: Liam accompanies Miley to the CNN Heroes Gala in Los Angeles. February 2012: Liam tells Details Miley makes him "really happy." They attend another round of Oscar parties, including the glamorous Vanity Fair bash. March 2012: Miley accompanies Liam to the Los Angeles premiere of The Hunger Games. Engagement rumors brew shortly after Miley is spotted wearing a ring on ~that finger~. I'm not engaged. I've worn this same ring on this finger since November! People just wanna find something to tal about! It's a topaz people! June 2012: Miley and Liam announce their engagement. Miley tells People, "I'm so happy to be engaged and look forward to a life of happiness with Liam." November 2012: Miley appears on The Ellen DeGeneres Show, gets a lap dance, and confirms she's not having 47 weddings. She also says her wedding "has to be perfect" and "has to be like a soundtrack in a movie." January 2013: Miley and Liam holiday together in Costa Rica. Liam is shirtless. (We don't have the pictures of this trip, we just thought you'd like to imagine it). February 2013: Miley fires back at Perez Hilton after he accuses her of cheating on Liam with Ed Westwick. Miley and Liam attend separate Oscar parties. Fresh breakup rumors begin to circulate. March 2013: Miley is spotted without her engagement ring, leading many to believe the wedding is off. Never mind. The ring is back again. April 2013: Billy Ray Cyrus tells Nightline he doesn't know if Miley and Liam will marry. "They're young, they're kids. The great news is they're great friends. And if you end up getting married, that's your business too, you know?" People quotes a source saying the couple wants to postpone the wedding. June 2013: Miley and Liam are photographed for the first time in five months while going to the movies. August 2013: Miley attends the L.A. premiere of Paranoia with Liam. It would be their final red carpet appearance together before breaking off their engagement. August 2013: Miley twerks at the 2013 MTV VMAs, and the world loses its mind. September 2013: Miley unfollows Liam on Twitter. Three days later, her rep confirms their engagement has been called off. Liam is spotted kissing Mexican actress and singer Eiza Gonzalez. In her first post-Liam performance, Miley breaks down while performing "Wrecking Ball," a song believed to be about Liam. (Warning: you may feel chills). October 2013: Miley talks about Life After Liam in Cosmopolitan's December 2013 issue: "This is the best time of my life. I'm not going to look back on it and be like, 'I wish I hadn't been dwelling over a breakup,' you know? Because that's not what God wants my life to be about right now." July 2014: Liam reportedly tells friends while holidaying in Italy that he and Miley will "always be best friends." October 2014: When asked about Miley in a NYLON interview, Liam says, "There's not much to say." November 2014: Miley starts dating Patrick Schwarzenegger, and Piley is born. December 2014: Liam's older brother Thor Chris Hemsworth seems to take a dig at Miley in an interview with GQ magazine, saying: "I've watched Liam do things I did at his age, like being in relationships he shouldn't be in, or being reckless just to prove a point." Shaaaaade. April 2015: Miley and Patrick break up. July 2015: Miley and Stella Maxwell ride "dinosaurs" together and everyone thinks they're dating. Miley tells Elle UK one month later that she is pansexual and not in a relationship. October 2015: Liam tells Men's Fitness that being with Miley was "an important part of my life." "You fall in love with who you fall in love with; you can never choose." Miley sports a TMNT onesie that looks very similar to the one Liam wore more than one year ago. November 2015: Liam adopts a huge 6-month-old dog that he calls Dora the Explorer. It's then revealed that Miley's actually the one who set up Liam with his new pooch, as the pet center he adopted from also posts a photo and namedrops Miley in it. December 2015: Miley and Liam spend New Year's Eve together in Australia, along with his family and friends. After being spotted "kissing and cuddling," fans start hoping that the pair are reuniting. January 2016: Miley is pictured wearing a flashy ring on ~that finger~, sparking more rumors. After posting a selfie with the ring in plain sight, people realize that it's the same Neil Lane ring Liam gave Miley nearly four years ago. Photographers catch Miley and a moving truck at Liam's house. People sources say Miley "seems ecstatic" about the reunion. February 2016: Life & Style magazine report that Miley and Liam have already tied the knot, claiming that the two had se "secret sunset wedding ceremony in Australia over the winter holidays." Hmmm. April 2016: Liam flat out denies that he and Miley are engaged, telling TV Week: "I am not engaged, no." Bit confusing. The two are also spotted together for the first time since their reunion. May 2016: In an interview with GQ Australia, Liam goes into detail about his and Miley's breakup, saying: "Of course it was hard, man. But at the time we were going in different directions and it's just what needed to happen. We were both super young and it was a good decision at the time—we both needed that." Finally addressing Liley 2.0, he adds: "People will figure it out, they already have... They're not dumb. I guess when I feel something, then I just feel it and I go for it. I make my decisions about what's going to make me happy, what I think is right and what I want to do — and I don't worry too much outside of that." June 2016: Miley posts a picture of her wearing a t-shirt with the name Hemsworth written across the back. She captions it with some cute heart-eyed cat emojis. July 2016: The couple spend July 4th together, but keep the celebrations low-key. No Taylor Swift squad situations here. July 2016: Miley "gets a tattoo dedicated to Liam" as she's pictured with a new inking—a jar of Vegemite. Can't get more Australian than that. (Still) July 2016: Liam and Miley have some fun with the paparazzi after they're spotted leaving lunch together. Miley decides to make things Instagram official with Liam, as she shares a photo of him and his dog Dora, captioning it: "So much love in one pic." AWWW. August 2016: Liley's reign of cuteness continues, with Miley sharing a video of the two singing along to Justin Bieber in their car. Liam even shows that ALL boyfriends can be annoying, as he pretends to swerve the car and Miley promptly shouts at him. Celebs, they're just like us. September 2016: US Weekly reports that Liam and Miley are working on a romantic play together, which could mark their first collaboration since they filmed the movie The Last Song.